Any westerner who has driven in a car, rickshaw, van or motorcycle in India will tell you its an experience that has to be lived to be believed. I have been in India for 4 days now. Its only been a short while but I have been a passenger on many car trips, varying in length from 200 metres to 110 kilometres. My observations thus far are that the rules of the road do not vary regardless of the length of the journey. 1. Right of way is always given to Cows. 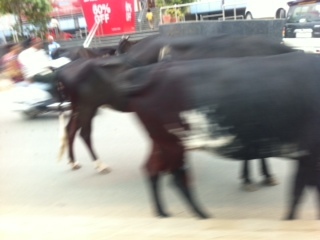 Cows are sacred animals in India, and at all times they have right of way on the roads. This means if they choose to stop and have a nap in the middle of the road, then so be it. They can not be physically moved or disturbed against their will. On my first car trip from the airport to home, we traveled on an expressway with a speed limit of 100 kmh. On several occasions, my driver had to slow down and dodge a cow who had chosen to casually cross the expressway at that particular time.The cows remained safe and the journey continued without anyone batting an eyelid. That’s what I call a Win Win situation. Many larger roads have designated lanes to manage the flow of traffic, or so the theory goes. But in India, lanes have no use because the traffic manages itself in its own way. Cars ebb across the whole road, and are guided by when to move based on the toots they here (see Rule 4). With that system in place, there is no need for another, it’s just another layer of unnecessary bureaucracy. Speed limits do exist on Indian roads, but even on the expressway, I am yet to see anyone come close to them. With all the animals (see Rule 1) and other drivers crossing lanes (see Rule 2), it is virtually impossible to travel at any speed without risking serious damage. After all, at 100kmh there is no way you could miss the cyclist who is on his mobile phone and hasn’t seen you come up behind him. The biggest mystery for me on the Indian roads is the “Code of the Horn Toot”. I am still a little uncertain about all the intricacies of this rule. So far it seems that if you want someone to get out of your way you must toot your horn at least twice. Then anyone who is within a 3m radius of your car will move out of their way. This doesn’t always work though. This morning, as we were driving over a narrow bridge, my driver tooted twice to indicate to a motorcyclist that he should move to the left and let our car through. The motorcyclist did this, but then veered right slightly before our car had a chance to pass clearly. The result…. his mirror clipped the tail end of our car and he lost balance and fell to the road with his vehicle on top of him. Thankfully we were traveling so slow (see Rule 3) that no serious damage was done, just a graze to the elbow, a broken side mirror and a damaged ego. That didn’t stop my driver from going over and giving the motorcyclist a serve for failing to listen to his double horn toot. Clearly the rule had been violated. On some occasions I have heard a single horn toot. I have absolutely no idea what this means and what action it invokes. More observation is require here I think. The only limit for seating people in a vehicle is engineering. If you can get 20 people into a rickshaw then go for it. This means in many vehicles, you will see an array of limbs, torsos and heads sticking out of windows and doors as they drive along. I think the most I have counted thus far has been 7 people in a small rickshaw, and there was a woman sitting on the window holding her child outside the car. So much for well fastened child restraints. Even on motorcycles, whole families travel with ease. This morning I watched a family go about their daily ritual, with the husband driving, his 2-year-old standing in front of him holding onto the handle bars, the wife behind with her legs to one side of the bike, holding an infant. Everyone looked comfortable and happy. I think this is only possible here due to Rules 3 and 4. I am staying with family at the moment as I get myself established with the basics (ie. phone, bank account, improved language skills etc). They have been incredibly generous, and have availed me with the use of their personal car and driver. I am not averse to being driven around, but I do enjoy a good stroll to see my surroundings and get some exercise. Yesterday I went to visit my cousin at his office (it is 200m from home) and so I chose to walk there rather than ask the driver to take me. When I arrived my cousin asked where the driver was, and gave me an incredulous look when I explained how I had got there. When you have the means to have a driver, walking is not required! Through western eyes the practices can look risky at first glance, but the rules protect everyone on the road and keep them safe. Aside from our small bingle this morning (see Rule 4), I haven’t yet seen any accidents. The trick is making sure you know what the rules are. Feel free to comment or add any other Rules that you know of, after all… the rules can always be changed because there are no set rules in India.